Thank You for this cute pig font set! Thank you so much for this very, very cute font. Thank you so much for the beautiful Funny font! Thank you Miss V for this wonderful alphabet! Thanx!!! need the Y yet!!! thanx oh missed the rest. hopefully i will chase it up. Thank you for all the piggies A - Z! Thank you for this wonderful alphabet. I really love the piggy font and want to thank you for sharing it with all of us. Thank you for this cute alphabet. 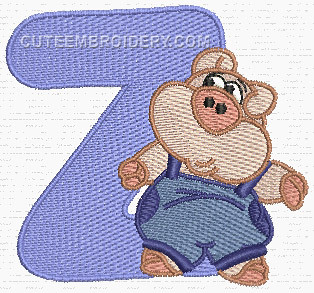 Thanks so much for the cute piggy alphabet. Thank you so much, this is such a cute alphabet. Yippee! The whole alphabet! Mr. Piggy just adorable. Thank you!! Thank you very much for this great alphabet. Thanks so much for you hard worrk. These little piggys are so adorable. Thank so much for funny cute alphabet! Thank you! I have the complete alpha. These are so cute I can't wait to find a use for them....I'll make one up! thanks you for this complete beautiful pig alphabet. Thanks soooo much for a cute alphabet!! Just like everyone else I thank you. I got all but my S. I haven't stitched yet but I will. Thank you so very much for sharing this adorable alphabet! Thank you this funny alphabet! Thank you for a fun Alphabet! grazie mille per questo bel alfabeto! thank you so much, think I got all of these, I missed a few in the other collection. Thank you so much for the pig font. Our neighbors host a big pig roast every year, and I will us the font to make aprons for them. Thank you so much for this amusing alphabet. I look forward to stitching it out for the grandkids. Thank you very much for all you give us. Thank you so much. I love all the little piggies. Looking forward what is next that you come with. You are so talented. Thanks! I, too, enjoyed Jacquipaul's comments. I was amazed by jacquipauls wit. I could not think of a name for each piggy. Thanks so much for a delightful alpha. Thank you for the piggy A-Z!! Every day I was looking forward for the new piggy and enjoyed jacquipaul's comment on each. I tried to predict her next comment and had only success with the Z!! Thanks to all involved. Thank you for this beautiful and funny abc! !